Wondering if anyone has came across this issue. While navigating any menus I get this yellow square at the top of the screen. It only appears when I’m navigating and not when just sitting in a menu. Just using the amazon menu. Are you using Amazon Menu or you are using an App(Android) on top of the Fire TV? 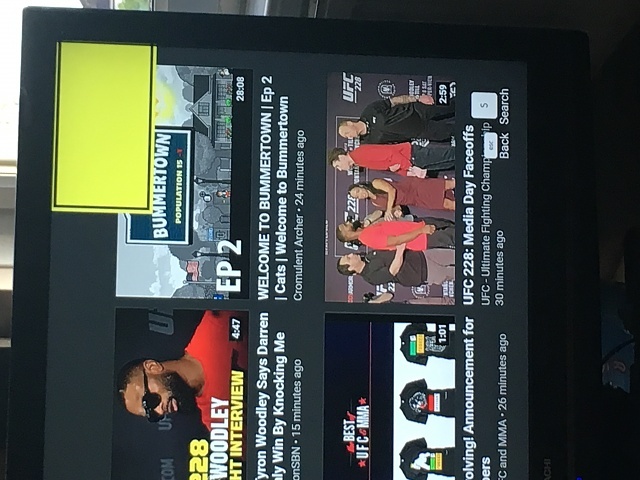 I cannot even get close to your example using the main menu in Amazon TV. Are you positive you are not running a downloaded app such as YouTube??? It looks to me a pop-up being blocked. Same thing just started happening to me today too. I notice it came with an update to the firmware. The magnifier should be specific to the yellow box, hopefully it helps. That worked straight away. Thanks for that. Help,,,don't know what to do. my emoji maker on s8? Will the S9 get the AI camera which is on Note 9?